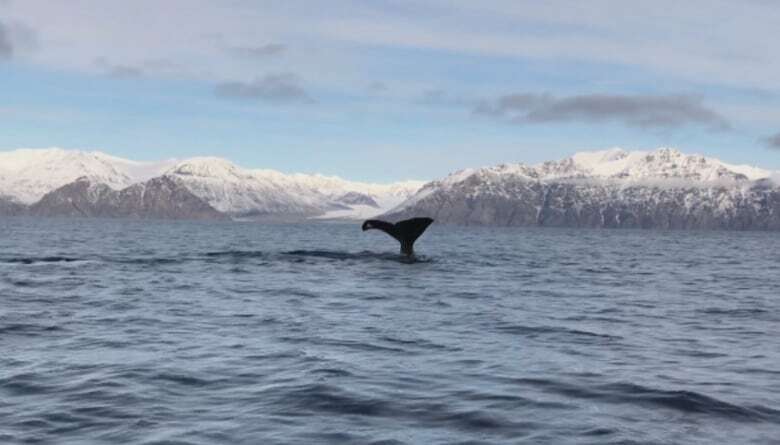 The two whales were spotted just 10 minutes outside of Pond Inlet, surprising local guides and scientists, who say it's a sign of shifts in the ecosystem. It was only when they got closer that Pond Inlet guide Titus Allooloo realized it was a kind of whale he'd never seen before. "They're not known by us, we don't know too much about them," said Allooloo, adding that the whales are not traditionally seen near his community. "It's only the second recorded observation of sperm whales in the region. Back in 2014 local hunters spotted them," explained Brandon Laforest, a World Wildlife Fund scientist. Laforest was on the boat to pick up acoustic equipment being used monitor the impact of marine traffic on narwhal for Environment Canada when the whales were spotted. One of two sperm whales spotted ten minutes from Pond Inlet at the end of September. The sighting is only the second time on record that a sperm whale has been seen so far North. 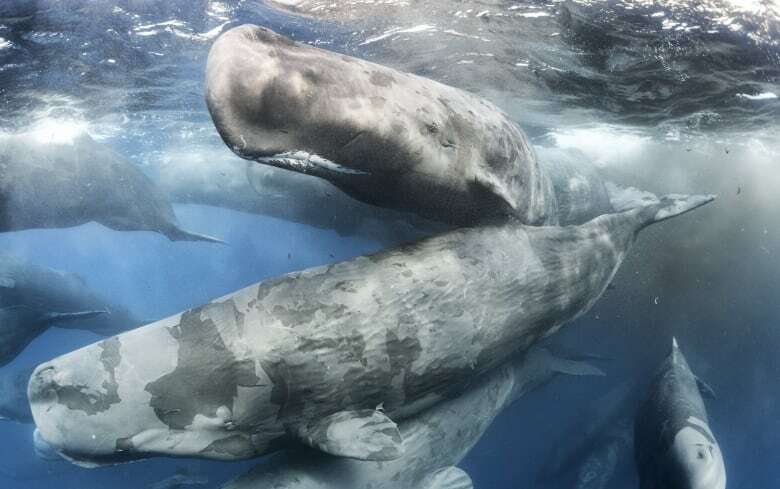 He says they've heard the call of sperm whales on their recordings before, but because the whales are known to have an extremely loud vocalisation, Laforest says it was assumed they were located further away in Baffin Bay. "When the ice is forming, that fin [on sperm whales] will get in the way, whereas narwhal and bowheads can actually break ice and continue breathing." 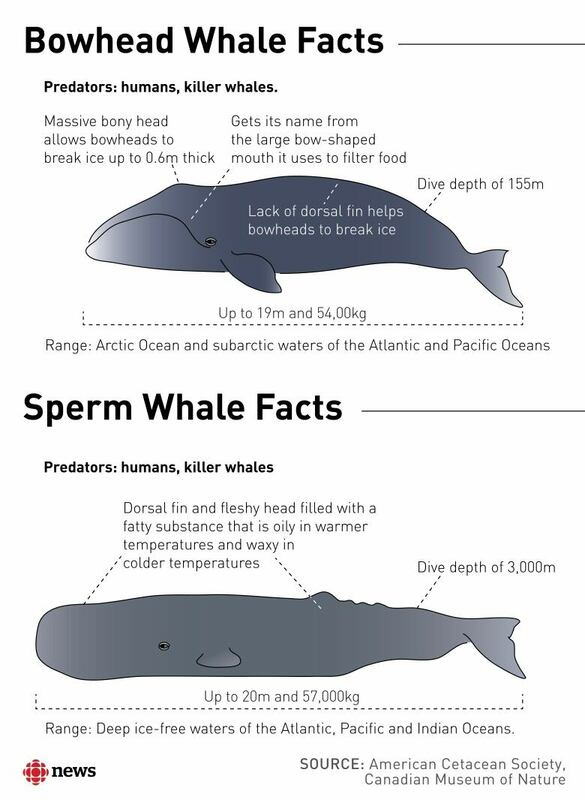 Laforest says that's good news for sperm whales, but may not be so great for Arctic species like bowhead "which traditionally live without much competition because of their intense adaptation to live in a relatively harsh environment." However, Laforest says he doesn't think the ecosystem is on the "verge of catastrophe," partly because sperm whales are not predatory. A group of sperm whale in the Indian Ocean. Unlike bowhead and other arctic whales the sperm whale has a fleshy fin and fatty head that is not adapted to breaking through ice. Killer whales, which Allooloo says are becoming more common in the area, are another matter. He says Arctic waters pose some risks for both sperm and killer whales, which could get trapped under the ice, if they continue coming North, although he says they haven't seen that happen yet. "We see that with northern whales as well, but inexperienced whales exploiting a northern habitat may not know to leave early enough before the sea ice forms." Allooloo says people in the community also noticed two huge whales last summer that they couldn't identify. He's hoping Laforest and his crew will be able to use their acoustic recordings to find out more about the whales that have been in the waters near his community.